This area of Rankin County, formerly called East Jackson and later the Gold Coast, was a hotbed for gambling, bootleg liquor, and live music for several decades up through the 1960s. Blues, jazz, and soul performers, including touring national acts and locally based artists Elmore James, Sonny Boy Williamson No. 2 (Rice Miller), Sam Myers, Cadillac George Harris, and Sam Baker, Jr., worked at a strip of clubs along Fannin Road known to African Americans as "'cross the river." The Gold Coast Mississippi state law prohibited the sale of liquor from 1908 to 1966, but humorist Will Rogers purportedly observed, "Mississippians will vote dry as long they can stagger to the polls." 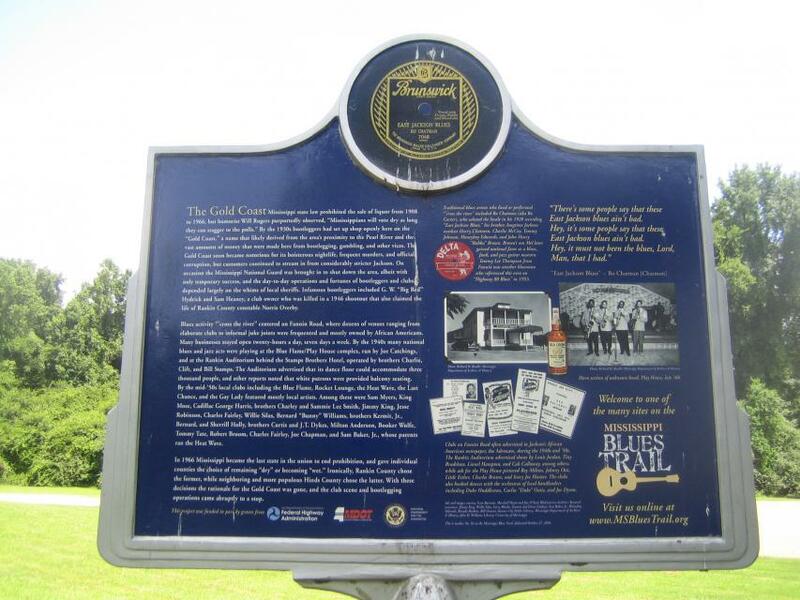 By the 1930s bootleggers had set up shop openly here on the "Gold Coast," a name that likely derived from the area's proximity to the Pearl River and the vast amounts of money that were made here from bootlegging, gambling, and other vices. The Gold Coast soon became notorious for its boisterous nightlife, frequent murders, and official corruption, but customers continued to stream in from considerably stricter Jackson. On occasion the Mississippi National Guard was brought in to shut down the area, albeit with only temporary success, and the day-to-day operations and fortunes of bootleggers and clubs depended largely on the whims of local sheriffs. Infamous bootleggers included G. W. "Big Red" Hydrick and Sam Seaney, a club owner who was killed in a 1946 shootout that also claimed the life of Rankin County constable Norris Overby. 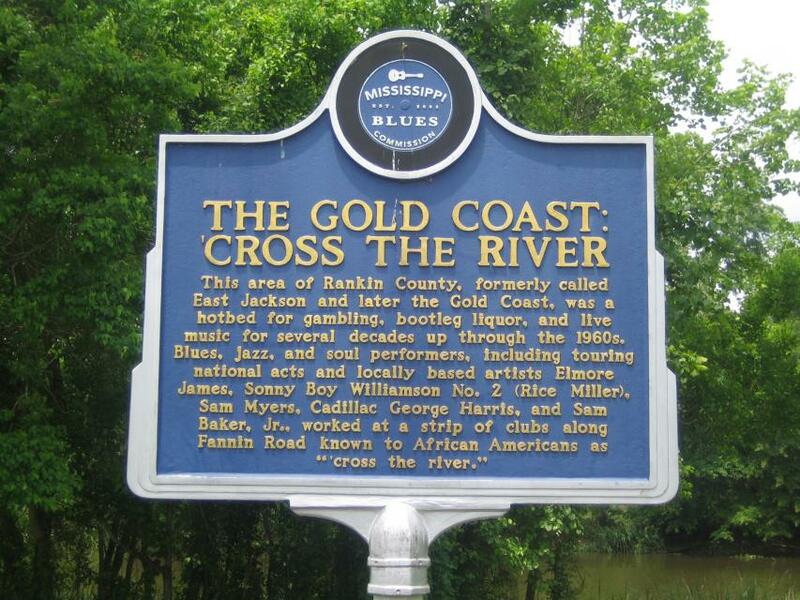 Blues activity "'cross the river" centered on Fannin Road, where dozens of venues ranging from elaborate clubs to informal juke joints were frequented and mostly owned by African Americans. Many businesses stayed open twenty-hours a day, seven days a week. By the 1940s many national blues and jazz acts were playing at the Blue Flame/Play House complex, run by Joe Catchings, and at the Rankin Auditorium behind the Stamps Brothers Hotel, operated by brothers Charlie, Clift, and Bill Stamps. The Auditorium advertised that its dance floor could accommodate three thousand people, and other reports noted that white patrons were provided balcony seating. By the mid-'50s local clubs including the Blue Flame, Rocket Lounge, the Heat Wave, the Last Chance, and the Gay Lady featured mostly local artists. Among these were Sam Myers, King Mose, Cadillac George Harris, brothers Charley and Sammie Lee Smith, Jimmy King, Jesse Robinson, Charles Fairley, Willie Silas, Bernard "Bunny" Williams, brothers Kermit, Jr., Bernard, and Sherrill Holly, brothers Curtis and J.T. Dykes, Milton Anderson, Booker Wolfe, Tommy Tate, Robert Broom, Charles Fairley, Joe Chapman, and Sam Baker, Jr., whose parents ran the Heat Wave. In 1966 Mississippi became the last state in the union to end prohibition, and gave individual counties the choice of remaining "dry" or becoming "wet." Ironically, Rankin County chose the former, while neighboring and more populous Hinds County chose the latter. With these decisions the rationale for the Gold Coast was gone, and the club scene and bootlegging operations came abruptly to a stop. This marker can also be identified by its HM code. You can use the hashtag #HM1JQC in tweets, and any other place where you might refer to this marker, including when searching on this site.